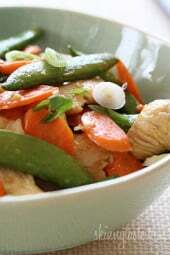 Spring vegetables and chicken breast strips sauteed with fresh ginger, lime juice, and a touch of soy sauce for a quick weeknight meal. I love making stir fries for dinner, what’s better than throwing veggies and protein into a wok and having dinner ready in minutes. Honestly, when I make a stir fry, I usually use whatever vegetables I have on hand (great way to clean out the refrigerator). You can serve it as is or over brown rice, quinoa, noodles, cauliflower “rice”, whatever! 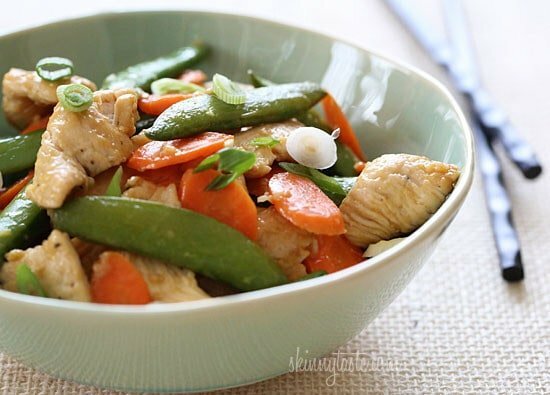 I love the crunch of the sugar snap peas with the chicken, and my daughter loves crunching on them raw while I’m cooking. What can you substitute for citrus. Citrus doesn’t agree with me. I love your recipes! They are guiding me along to tastiness and success in my WW journey. What is the technique to thinly slice the chicken breasts? They look just like they do in an Asian restaurant and I’d like to do that at home. Great flavors and so easy to make! I love the “use whatever veggies are in the fridge” approach. I used broccoli and carrots served over brown rice. I also added extra ginger and lime juice. Delish! What is a good wok to purchase? I love Asian food and have never tried to make it at home. Too much lime juice made for a sour flavor that I was not expecting in a stir fry. I doctored up seasonings with a stir fry sauce to sweeten it up a bit. Probably wrecked the low calorie count, but it needed something IMO. Served with brown rice. This was really tasty and one of the easiest and quickest meals to pull together. Thanks Gina! made this tonight! Loved it x 1000000. Added some mushrooms to bulk up the veggies even more! Delicious dinner. We ate it over brown rice with a dash of soy sauce. Found it to be a very satisfying, filling meal! Another delicious recipe from Gina! 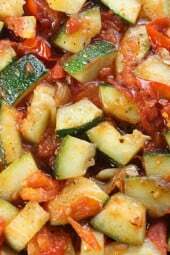 I had a red bell pepper that needed be used up so I added that too….loved this recipe! I'm such a picky eater but I loved this recipe! The chicken was amazing and tender. The only thing I did differently was substituted regular peas for the sugar snap peas. It was awesome. Thanks so much for this amazing recipe! I made this tonight, added onions, doubled the sauce cause hubby loves sauce (added a tablespoon of date honey) and served it over white rice- amaze balls!!! I have to say this is like the 20th recipe i made from your site and we're not even doing WW, i love everything! I made this tonight for my wife and I. We give it 6 stars out of 5!!! Thank you for sharing! Your recipe was great. I add my stir fried chicken on it and it was very delicious. Thanks for sharing this recipe here, I make my experiment on this. I made this tonight even though I don't own a wok. Made it in my All Clad fry pan without issues – everything cooked perfectly! Boyfriend LOVED it! Definitely will be cooking this again! I made this tonight and added pineapple because my toddler is obsessed with it. We ate it up happily. I really appreciate an Asian inspired dinner that doesn't require a million specialty Asian sauces and other condiments. Tasty! I didn't have lime juice so used lemon juice instead–still delicious. Sure love those pea pods. The lime juice sure adds something extra that is awesome! For an extra kick I added a little Siracha. Loved it! Thanks Gina, I made this recipe last night– it was delicious I added extra lime juice for a kick – fantastic! all your recipes are awsome, thanks so much for sharing, blessings! Made this tonight and my kids (4 and 1.5) loved it! I was pleased, too. 🙂 SO quick and easy. We served it with rice. Thanks so much! How do you keep the chicken from becoming dry? Another delicious recipe! I added mushrooms, threw in a packet of splenda to counter the sourness of the lime, and served it over quinoa. Thank you for turning me into an at-home healthy cook! YUM! I just made this tonight and we absolutely loved it! My boyfriend said "it tastes too good to be healthy!" Thank you! Definitely going on the regular rotation. I LOVED this one! Super low cal and super easy to cook! Tasty too! I made this tonight with onions, and served it over quinoa with a side of swiss chard….amazeballs! This will be in the rotation. I will be trying this. I don't have fresh ginger, do you think I could just use the powdered spice, which I do have? I love your recipes, Gina, thank you for all you do!!! Melissa, I made it using powdered ginger and it tasted fine to me. Ginger is not one of my favorites so I only added a small amount, but it didn't seem like anything was missing. I used ground because I mistakenly thought I had fresh in the freezer. It tasted good! 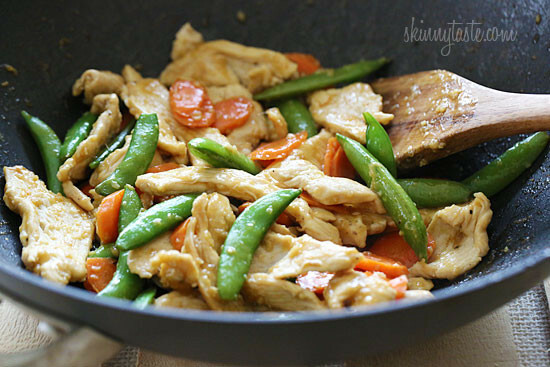 I really **DO NOT** like stir fry…but my husband does. So I decided to take one for the team and try it. WOW! It was really delicious. Now when I open my fridge or freezer I'm thinking of what I can combine it with to make this stir fry again. Yum! This was fantastic- it did not need a starch. I made this last night and it was so yummy!!! My 2 1/2 year old daughter has only ever eaten raw carrots until she had this for dinner! I served it over brown rice, delicious! 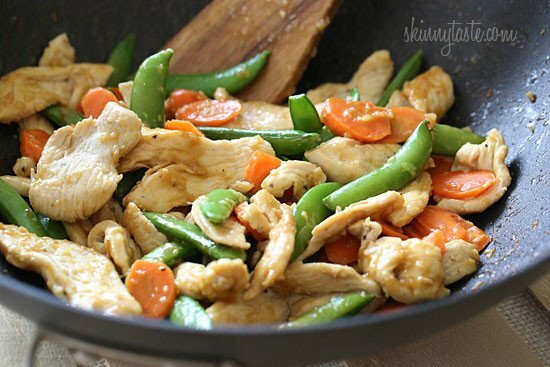 I totally agree – stir fries are the best way to use up veggies. Most everyone loves them too! wow, my family devoured this and my 6 year old daughter was upset this morning that there weren't leftover for her to take for lunch to school today..it was delicious! I double of your recipes for my family of 6, I may have to start tripling them, they cant seem to get enough! Life time member here but fell off the wagon. So today is a new start after a few years so I turned to Gina…You keep things so on the move with new ideas and recipies. 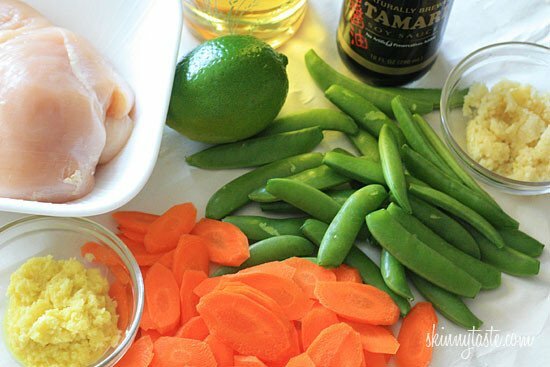 This chicken stir fry looks wonderful what a great beginning. When I joined WW yeas ago it was so boring you really help making a life change worth while. Love the fact you keep the points for us thats the best way to go. Keep em coming Gina!! Thanks so much for all your yummy recipes! I've been doing an 8 week healthy lifestyle competition with friends called Feel Great in 8. Your website and recipes have made my goal of eating well and succeeding in the competeition so much easier. Thanks again!!! Yeah.. like never mind, I was thinking Fresh Horseradish, ginger was an easy grab.. my bad..
Looks nice, crisp and easy. However, shopping for fresh ginger is an adventure in the expensive root search category. Is there an alternative you can think of? Sometimes, you can find ginger is a sort of paste form in a tube. Usually in the produce section where the fresh herds are. Is it the same directions if I use a regular fry pan instead of a wok? already made this twice 🙂 it is soooo good! 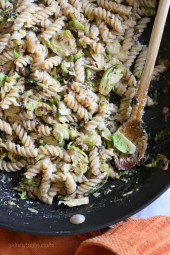 Yum, I'm going to make this tonight with the soba noodles I've been meaning to use! Looks fresh, healthy and delicious, thanks Gina! Made this for the family tonight. It was delicious, a big hit with my husband. Looks and sounds delicious. I have been trying to introduce other grains besides rice to my family's diet to get away from so much pasta. Have any good recipes? The Spring stir looks more delicious than any other recipes, it is a healthy and good for diet plans as it consists more veggies.For Paleo dieters you have also given replacement for ingredients so thanks to that. I am so excited to see that you have created a Paleo label! I was recently diagnosed with a bunch of food allergies and was basically forced into a Paleo diet. Thank you thank you! Gina, this looks delicious! I actually plan on making this tonight! My husband loves when I make stir fry. I don't have any rice oil so I will use some of the hot sesame oil- a little packs some much flavor! Sounds delicious! I don't have the peas, but I do have asparagus. I know what's for dinner tonight. Thank you for all your great recipes. I have been recently enjoying many of your recipes and purchased the crockpot, misto, and food scale that you recommend. Any recommendation on a wok before I make my next purchase? Looking forward to this recipe too. I like a heavy non-stick one, mine is Caphalon. I think I will try this, but maybe also add some sautéed mushrooms to the mix! Great, glad you liked it Teresa! I love all of your recipes. I cannot wait to try this one. There are not enough days in the week to try all of your wonderful WW friendly recipes! Thank you! this looks amazing!!! i cannot wait to make stir fry with my veggies from my garden all summer. yum!! Un plato estupendo, me encanta la pinta que tiene! Ya me esta entrando hambre! Thanks for letting us know, is anything safe I wonder! Thanks so much for giving the Paleo option substitutes!! 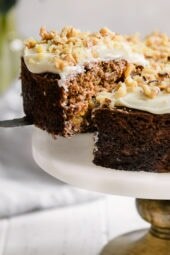 I love your recipes and am loving that you're giving more gluten and dairy-free options. Can I make this without the cornstarch? Love skinnytaste, use your recipes 5x a week! Awesome, can't wait to try it! Friday's in our house is called Stir-Friday! This is awesome. By the way do you eat organic meat? We've just made the switch but I want to cry every time I see that two chicken breasts costs ten bucks. What are your insights? I do when I can, I usually buy Murrays but I know, it's expensive. Buying in bulk and freezing the rest is the cheapest way to go. I WAS going to make left overs for dinner tonight….not anymore!!! I have everything I need for this recipe and it sounds so good!! Thanks Gina!! What a great stir fry!! Great for a quick weeknight dinner! love how you can PIN right on the photo to PINTEREST. Thanks Diane, makes it so much easier, right?! What type of noodles do you recommend with this? I like rice noodle or soba, even buckwheat. I used whole grain quinoa and it was fantastic! This looks great! 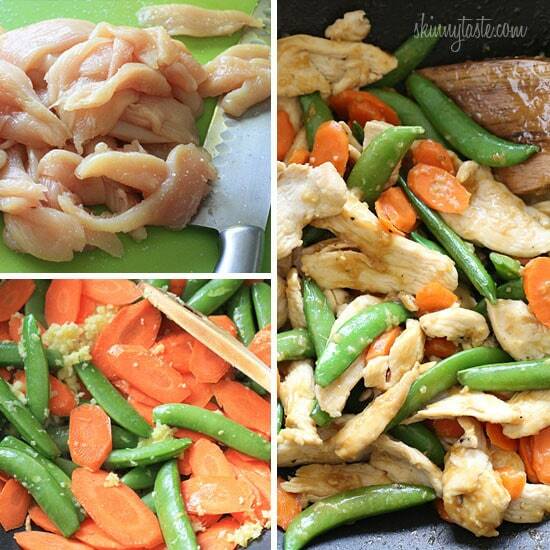 Definitely going to try it soon, I love stir fry! This sounds wonderful!!!! I think even my meat/potato husband would like this!!! We had almost the exact same thing for dinner last night! At home stir fries rock!